Home / Lifestyle / How to Clean Doors Quickly and Effectively? How to Clean Doors Quickly and Effectively? As we all know, the doors are made up for various materials coming in many different sizes & designs like plain solid wood, vinyl, steel core, folding doors, decorated glass doors, storm doors, so on and so forth. The commonality between all of these types, materials and designs is, they'll be hung, set in a frame, balanced & leveled. Whether your doors have threshold or tracks, they need to be cleaned at any cost. Add all of these ingredients in a spray bottle. Mix thoroughly. · WD-40 for squeaky hinges. · First of all, you need to wipe the top of door frames in order to remove dust. You might want to use feather duster for that, but a soft rag works even better in that area. So just make sure that use the most suitable tool to get the best results. · In the next step, you'll be wiping all around the frame of your wooden door. You can use either feather duster or a rag for that. 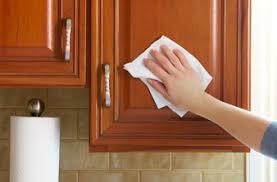 · Make sure that you wipe the entire surface of the door with oil soap using a soft rag. Quick Tip! Wipe it in the direction of grains. · Buff it to remove excess and to dry the surface. · Ensure to use a sponge while applying the all-purpose cleaner to painted doors. Top wipe it dry, use a soft, clean rag. · For the door knobs & handles, you can use the homemade all-purpose cleaner. Wipe it well to ensure there's no dirt and then dry. · Some of the doors have brass fixtures as well. For that, you can go for either commercial or homemade brass cleaner. It's easy to prepare. As per professional maids in Dubai, just grab a clean plastic container and mix 1/2 cup vinegar & 2 tbsp. of salt in it. · In case your door has a glass inset like a window, etc., you can try using the glass cleaner just to make sure it sparkles in the end. To make a glass cleaner, you need to mix 1 tsp. Liquid detergent, 6 tbsp. Plain white vinegar and 4 cups of water in a spray bottle.